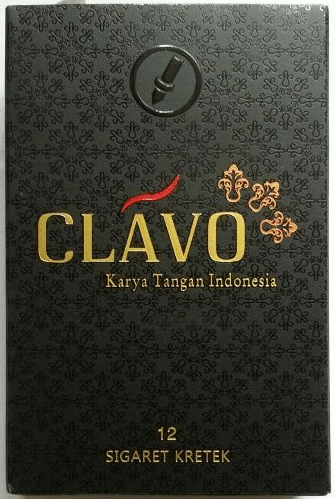 Clavo is the Premium Indonesian Cigarette made from the A-Class tobacco? and Premium Clove. These were very much like a cross between a Sampoerna and a Djarum 76. Unfiltered, mild and less sweet taste, seemed more jackfruit and less citrus. Not bad if you like traditional Djarums. These are unfiltered, but the tip of the paper is still lightly sweet. Definitely stronger than most of the other Djarum varieties, and it seems they’re rolled a bit tighter, so the smoke will take a few minutes longer. I highly recommend. I have bought 2 cartons so far. That in it’s self means I really like them. They are hand rolled and as such the tightness does vary. Smoke times have been from around 7 minutes or less to nearly 15 minutes. Also the clove content seems to vary. Has a nice dense smoke with cloves popping off sometimes. As I chain smoke all kreteks, I noticed some lung irration after a while. But if you are an occasional smoker of cloves, you will probably not notice this. I reall don’t care about what the pack looks like ( I never quite understood Davies need to rate the pack design). But I give a solid 10/10 on body and a good 9/10 on flavor. Overall I give it a 9/10 and highly recommend to all kreket smokers that want something new. I am considering starting a YouTube channel to fill the void left by Dave’s departure from kretek reviews.